Floyd D. Tunson's "Where the Hell is Batman?" Image courtesey of the artist. This month's Free Family Adventure Day explores themes found in the exhibition, Floyd D. Tunson: Son of Pop. As an artist, Tunson works extensively with a broad range of media, and his style creates unique and particularly thought provoking works of art. 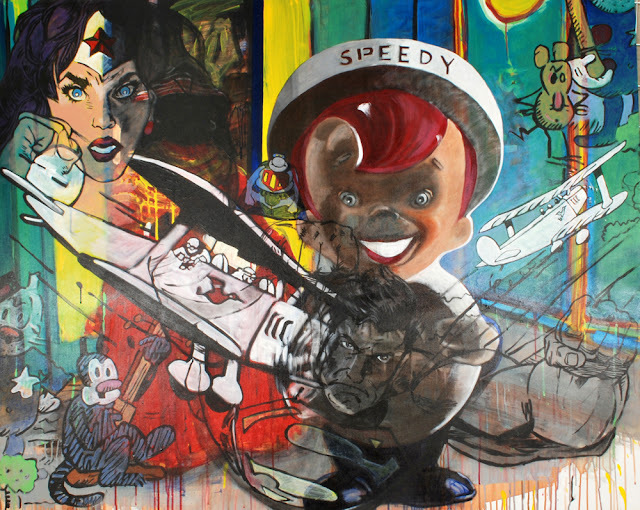 Some of Tunson’s eye-catching pieces reflect a strong form of pop art, and include pop culture references such as Coca-Cola, comic book super heroes, and the TV show Leave it to Beaver. Pop Art is often a running commentary on consumerism as well as the social norms pervading countries such as The United States of America as well as Britain. It is typically intended to be a type of satire. It was particularly popular during the 1950’s and rose to it’s peak in the 1960’s with the rise of Andy Warhol’s famous "Campbell Soup Cans" and Roy Lichenstein’s “Drowning Girl.” Perhaps some of the most well known pop art collages are by Richard Hamilton who debuted his pop art collages at a London exhibition in 1956 as well as reworked piece in 1992. This Family Adventure Day, families can try their own hand at pop art, as Bemis School of Art instructors will be on-hand to teach how to create pop art collages. In addition, explore other art styles found in Tunson's work by creating shadow boxes from found objects and sculpting Nubian Clay figures. This is sure to be a wonderful combination of three very different forms of art that is perfect for all ages and skill levels!